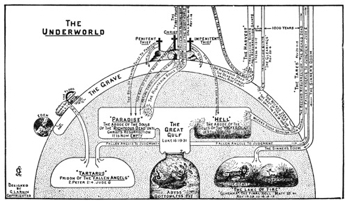 BoingBoing, one of the worlds biggest and best blogs takes a theological journey into the pre-tribulationary, eschatological, dispensational, diagrammical fantastical charts of Clarence Larkin. They post it under “art”. Does kinda look like cool wallpaper for a blog . . . or a Prison-Break full-body tattoo. I have one of the actual posters but it is still in my library in California. Maybe one day . . .
me also. my chart folds out of the book. very RETRO!